Traditional hot blueing methods work best where major work is required but for minor areas. Bisley Blue Gel is an inexpensive, viable and easy to use alternative. 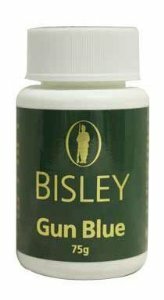 Bisley Blue Gel gives deep even blueing of gun barrels and other metal parts. You can reblue worn and scratched gun barrels with this easy to use cold blueing method.